Photography 37mm to 30mm Step-Down Lens Adapter Ring For Filters : allputer.com - Accessories for all your Portable Electronics & Computers! This step-down rings are made of premium grade aluminum with precision. Every ring is inspected to ensure smooth mounting. Every ring is polished and finished with anodized matte surface for professional appearance. 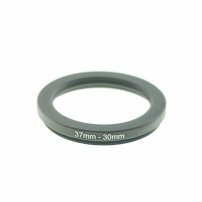 This step down adapter ring allows a filter/attachment with thread size of 30mm to be used with a lens with thread size of 37mm. - The 37-30mm ring adapter easily screws onto the front of any 37mm lens, and converts the thread size of your lens to the thread size of any other 30mm accessory (such as filters, hoods, flashes and lens converters). - Your camera's lens thread size will be marked somewhere on the lens barrel. This number is always preceded by a "Ø" (diameter) symbol. For example: Ø52 = 52mm lens thread size. This number can also often be found printed on the back side of your lens cap. The first number is always the lens thread size, the second number is the filter size of the accessory. If the first number is bigger, it's a step-down ring. If the first number is smaller, it's a step-up. - Product Dimensions: 38mm dia. approx.